Twin Cobra, known as Kyuukyoku Tiger (究極タイガー) in Japan, is a 1987 arcade shoot-'em-up by Toaplan ported to the Sega Mega Drive in 1991 and released in Japan, the US and Brazil. The game auto scrolls like most shoot'em ups, A boss awaits at the end of each stage. The game loops after clearing it. shoots. and drop bombs (which is available in a limited supply). These have very big radius and power, furthermore absorb all bullets while the explosion lasts, but also have a (intentional) delay. Autofire cab be turned on or off. Using an autofire controller can give higher firing rates than the game's internal autofire. Powerups are collected in the usual manner but are scarce as only green helicopters drop them. Compared to other game's power up carriers, these are exceptionally well armored. It's worth mentioning that weapons and weapon power ups are different items. The game was also ported to several others systems of different generations like the NES; FM-Towns and PlayStation as part as Toaplan Shooting Battle Vol.1, the latter being the most faithful port. In 1995 it received a sequel, Twin Cobra II/Kyuukyoku Tiger II, which would be ported exclusively to the Sega Saturn and released in Japan as Kyuukyoku Tiger II Plus. A boss in Namco's shoot'em up Dangerous Seed is called "Ultimate Tiger", which is a direct translation of Twin Cobra's name. This could be a deliberate reference. By default the Mega Drive port of Twin Cobra is harder than its arcade counterpart, but this difficulty it can be adjusted in the options menu. Its overall presentation (complete with the "insert coin screen"), gameplay, levels layout and enemy patterns are faithful to the arcade original, unlike a rival PC Engine version which stripped its gameplay down and offers simplified presentation and stage design. The Mega Drive Twin Cobra has a very simplistic way of handling colour, choosing a 64 colour palette at the start of the game and sticking with it regardless of what is happening on screen. This leads to some curious design choices, such as the tanks in stage 1 being bright yellow, as their palette is shared with explosions. On top of this, 16 of those colours are reserved for hit confirmation effects (yellow/red flashing when hitting an enemy), giving even less choice for stages and objects. This Mega Drive variant of the game is slightly misleading. 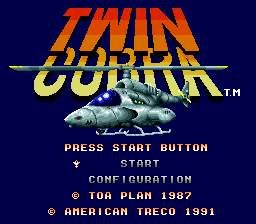 The name "Twin Cobra" (or Twin Cobra: Desert Attack Helicopter as listed on the packaging) originates from the localised arcade name for Kyuukyoku Tiger, but the "twin" implies "two", when it is in fact only a one-player game. In Japan, the arcade Kyuukyoku Tiger was originally released in a single-player only-form - a product which did not make it to the US, but is what this Mega Drive port is derived from. In Brazil this was partially rectified by simply calling the game Desert Attack Helicopter on its packaging, though it uses the Twin Cobra name in-game. Main article: Twin Cobra/Magazine articles. NEC Retro has more information related to Kyuukyoku Tiger.